Pictured: Three young women and one of the heroic young rescuers being attended to by paramedics after they almost drowned in the Sea near Swakopmund. 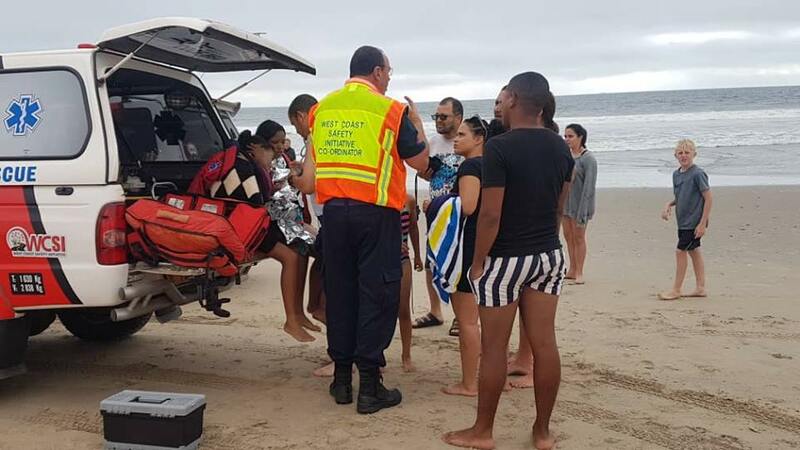 Three young men walked away from spending the day on the beach as heroes after their vigilance and actions saved the lives of two girls and a young woman who were in the process of drowning in the sea near Swakopmund. 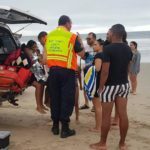 According to Aubry Oosthuizen of the Code Red private ambulance service who attended the scene, the two young girls aged between 12 and 16 were swept into the open ocean by the notoriously strong rip currents of the area between long Beach and Patrysberg on Sunday afternoon. He said their panicked shrieks for help drew the attention of three heroic young men that were also relaxing on the beach for the day. They ran into the waves and managed to bring the two girls and the young woman back to the safety of dry land where they were attended to by paramedics. According to Oosthuizen one of the young men almost got into trouble himself because the person he was helping were in total panic and hampered his efforts severely until he managed to calm her down enough to assist her to reach safety on shore. “The three young women and one of the young heroes were taken to a Swakopmund hospital for observation. In many such cases a secondary drowning can occur because of the amount of water that the victims ingested during their panic and they have to be kept under observation to prevent just such a situation,” Oosthuizen said. He said volunteers from Swakopmund Sea Rescue, the Swakopmund Emergency Services, Namibian Police and several other private ambulance services attended the scene and assisted the young people when they got back to safety.